How do you know it’s God? About a week ago, I was at the Willow Creek Global Leadership Summit at a satellite location. I enjoyed listening to the multiple speakers on issues concerning church leadership. The opening speaker was Bill Hybels, the lead pastor at Willow Creek and he spoke on the topic that is also the subject of his new book, Whispers. While I am not big on preaching other people’s series or going through programs, I have decided to use Hybels’ sermon series as a skeleton for a current series. Quite simple, I have been asked a lot lately on this topic and wanted to dive in more. Today, we covered what I think is one of the most important parts of this topic. How do I know what I am thinking God might be telling me is God and not just my imagination? I won’t put the whole talk here but I did want to put some basic points in case someone is wondering who might be reading this. First, Hybels’ part…. If you think God has put a “whisper” on your heart, he suggests that you ask five questions to help you determine if it is God or not. Ask God, “Is this prompting truly from you?” Pray to Him and ask Him to move to confirm His whisper. Also, consider God’s character and compare it to the whisper. Do they match? Ask “Is this whisper Scriptural?” Does it match up to the Word and how it instructs us to act, feel, and work? 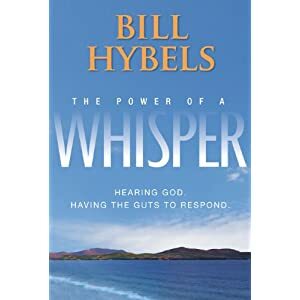 Hybels shares a story in his book about a man who heard a powerful song during worship and decided God was calling him to leave his job and pursue a job in Christian music. However, the man has never had any music experience, talent, or even really ever been drawn towards the arts before. Hybels encouraged him to maybe reconsider if this was God’s calling or if he was just moved by the song. He says God can call us to radical things but often He calls us to things He has prepared us for. Find some people who are mature in their faith, have shown wisdom in their discernment, people who know you and what God is doing in your life and see if you find confirmation in them through prayer and counsel. Well, that’s all I’ll share on his teaching. My hope is it is enough to wet your whistle and you go get the book and dig in more yourself. However, I’m not done yet! If you don’t mind, let me add some of my thoughts too. First, when you get a whisper, while it should match up to your character most times, that does not mean it should be in your comfort zone. When God gives you a whisper for the first time, it’s usually outside your comfort zone. If God puts a whisper on your heart and it matches how you feel, what you want to do, and what you think….. He probably wouldn’t have told you anything in the first place because you’re already there. Often, He puts on your heart a tough conversation to have, a sacrifice to make for others, or other challenges to bring glory to His name. However, when you move to the next level of finding confirmation, you are looking for things that match up to what He put on your heart. Let me bring up this point, confirmation is HUGE! I think there are two huge mistakes we can make when it comes to God’s whispers. First, not listening. The other, acting before we are sure it is God. Unless if He puts an immediate move, which He does from time to time and even then usually provides some confirmation, it is worth taking some time to seek confirmation. A lot of people have hurt a lot of people in the name of “God” because they didn’t get confirmation. If you have a whisper that you are considering rather or not it’s from God, follow the first part of this Scripture. Get your goals, your mindset, the way the world says you should act, what your parents think, and the like and shove them to the side. Let go of the things of the world and then you can be transformed by the renewing of your mind as you focus on the ways of the Lord. Paul tells us that then you can test and approve the will of God. In other words, confirming God’s will is often times a process of putting feelers out, asking the Bill Hybel’s questions, and seeing what doors open and what ones do not to find if it is of God or not. Several times, when talking about this verse, people will say to me “I still can’t tell if it’s God or not.” Each and every time we talked, it was evident that the problem was in them following the first half of the verse instead of the not getting the promise of the second half. So, do you feel a whisper on your heart? Something you think God is calling you to? Maybe some of Bill Hybels teaching and some of my babblings might give you some fresh ideas in seeking confirmation. Do you mind one last bit of advice? Once you hear God and confirm it’s Him, go for it! He has something wonderful in store to bring glory to His name! Get the book: If you are in Marion, Ohio, let me encourage you to get it at Hope Crossing bookstore in town to support their local ministry. If not, then consider buying it at your local Christian bookstore. Hear the message: It might take a week but the message I gave at The Shepherd’s Fellowship should be here.